For life science companies, positioning is the DNA of marketing. Just as DNA guides protein expression and thereby controls much, if not all cell activity, so positioning should guide marketing activities. Just as DNA is tucked inside the nucleus, and therefore ‘invisible’ to the rest of the cell, the definition of a company’s positioning is internal and private. For this reason, positioning is widely misunderstood. This article explores the four components of positioning and provides a framework for understanding positioning’s role in marketing. What is this thing called Positioning? If there were commandments in marketing, one of the top ten would be: Marketer, know thine positioning. While this doesn’t have the pedigree of Honor thy father and mother, proper understanding of the role of positioning is fundamental to successful marketing. Positioning should guide all marketing activities. Its definition is private, while its expression is public. This private nature tends to obscure its role, so more attention is routinely given to the public expressions of a company’s positioning: taglines, identities, messaging, etc. There are many definitions of the word positioning. Most commonly, it refers to the way potential buyers see a product or service relative to competitive products or services. Shown here is an example of a typical positioning matrix. This plots competitors’ market shares against a series of attributes. This type of positioning matrix typically focuses on a small number of attributes. 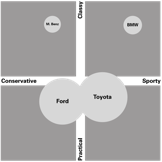 Figure 1: A typical positioning matrix, plotting market share vs. a small number of metrics. In contrast to focusing only on the competitive position of brands relative to each other, I prefer to think of positioning more broadly: Your brand’s Positioning is the “space” in your audience’s consciousness that your organization tries to establish as belonging solely to your brand; you want to “own” that space – that position. The act of defining and promoting a positioning is your organization’s conscious effort to communicate specific messages and attributes about your brand. The audiences’ perceptions of your efforts is the Image that they create in their own heads – which may not always align with the stated Positioning. In other words, the message sent is not always the message received. Regardless of your definition, the communication of your brand positioning involves trying to give your brand meaning, to create associations between your brand and certain attributes in the minds of your audiences. Positioning is the fundamental starting point for all your marketing efforts – the DNA of marketing, if you will. Why is positioning important? Positioning is the fundamental starting point for all your marketing efforts – the DNA of marketing, if you will. The goal of positioning is to create a unique image in the audience’s consciousness. Clear positioning is absolutely essential if you want to create a proper, clearly differentiated image. The dialog between audience and brand is a complex one, and brands help audiences paint a picture in their own head about what the brand stands for. If you don’t have a clear sense of what these brand attributes are, and if your brand attributes are not unique, you can’t create effective marketing. Positioning is given life by the communications between your brand and your audiences. Deployed successfully, the image of your company that audiences create matches the positioning you choose to project. This happens through the execution of your marketing, and through various communication channels. There are four key components to a brand’s positioning: Context, Promise, Personality and Values. Context: Who are the target audiences? Which of these is primary? What is their worldview? What is their educational training? What titles do they hold? What are their demographics? What values do they share? What is your target market segment? What are your specific products and services? What is the nature of your brand’s competition? What are their claims? What is their unique selling proposition? Promise: How do you define your uniqueness, your value proposition, your ‘secret sauce’? What are the benefits that your brand can deliver? More importantly, which of these, or combination of these, are unique – available from no other brand? What reasons can you offer your audiences to believe that these unique benefits are available exclusively from your brand? Are these benefits verifiable before purchase? Personality: How does your brand behave? What is your brand’s disposition? What emotional connection are you forging with your audiences? What will they love about your brand? What distinct attributes do you want your audiences to associate with your brand? These are part of your brand’s personality. Typical answers to these questions involve adjectives that describe your brand. For example, is your brand’s personality more theoretical or real, timeless or current, lighthearted or serious, proven or innovative, predictable or surprising? Some of these positioning questions address rational issues, while others address emotional issues. Brands are complex constructions, and both reason and emotion play key roles. Defining the answers to these questions helps you define your brand’s positioning. Nothing could be more important than defining this positioning clearly. Positioning is like the DNA inside a cell’s nucleus; it is hidden from the rest of the cell, and its effects are only visible through intermediary mechanisms, for example, protein expression. The way positioning gets expressed is through various channels of communication. These channels are shown in Figure 2. Figure 2. 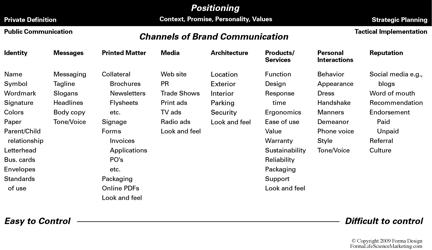 A Brand’s image is built by the systematic and strategic use of the channels of communication shown here. Your organization’s positioning is the conscious effort to project a specific image. The image is the sum total of all the impressions the audience receives through the various channels of communication. One of the core components of clear positioning is proper context. A major component of your brand’s context is your brand’s audience(s). Most people would expect the word customers rather than audiences in this statement, but I use the word audiences deliberately. Your customers are only a small segment of the people who will come in contact with your brand. And your customers are only a small segment of the people who will play an important role in your brand’s success. Customers are important, but there are many other important audiences as well. In addition to your customers, you are also communicating with your potential customers. And let’s not forget your investors and potential investors, your suppliers and potential suppliers, the media, your employees and potential employees, the FDA, the postal carrier and other delivery people, the janitorial staff and any other people who happen to come in contact with your brand. Taken together, these form the audiences for your brand. The word “Audience” implies that all these different groups are sitting quietly in their seats, waiting for you to say something. Of course, nothing could be farther from the truth. Now, “audiences” is not the perfect word, because it implies that all these different groups are sitting quietly in their seats, waiting for you to say something. Of course, nothing could be farther from the truth. The analogy works better if you envision them as a collection of middle-school students. They are all busy, and chattering away among themselves. They have their own concerns. Getting their attention is not always simple or easy; holding it can be even more difficult. So – once you realize that many people will come in contact with your brand, not just customers, now what? Careful and effective marketing will address most, if not all, of these audience groups. Ignoring any that you identify as primary, secondary or even tertiary can be disastrous. To give a very clear example, life science companies that are dependent on venture funding cannot focus only on customers while ignoring investors, or the media, or even employees. All will play a key part in the success of a life science company. It is important to pay attention not only to what you say (content), but how you say it (tone). This is one issue that many life science companies seem to have a particularly hard time understanding. Many concern themselves only with content (specifically technical content), and not with tone of voice. That’s understandable; it’s difficult enough to figure out how to communicate a technically complex message without worrying about things like tone. In most marketing situations, nothing could be more harmful. Albert Mehrabian, Ph.D., Professor Emeritus of Psychology, UCLA, has published on the importance of both verbal and nonverbal messages. His findings on communication are commonly known as the 7%-38%-55% Rule. Mehrabian came to several conclusions in his 1971 studies, most notably that there are three elements in face-to-face communications: Verbal (words), Vocal (tone of voice) and Visual (body language). These three factors are accorded different weights when judging the amount we like the person who is speaking: Verbal accounts for 7%, Vocal accounts for 38% and Visual accounts for 55%. These results are often interpreted more broadly than Mehrabian’s experiments would actually support, but the basic truth remains: communication is more that just the words you use; tone of voice is important, and in some circumstances tone (how you say it) can be as, or even more, important than content (what you say). Most marketing is not done face-to-face, so Mehrabian’s percentages don’t translate exactly, but the Visual component he identified is still crucial in marketing. The look and feel of a web site or a brochure communicates quite a bit about a company’s personality. When biotech and life science companies run into difficulties in marketing, it is often because they put too much emphasis on the Verbal (the words alone) and ignore the Vocal and the Visual. What does Positioning look like? A positioning document is internal to your company. A useful analogy is a business plan. A business plan is a private document. It fleshes out the targets, goals, strategies and tactics that will be used to drive business activities and success. But these targets and goals are rarely shared publicly. From the outside, all an observer can see is that the organization is behaving is certain ways. Those behaviors are (or should be) guided by the business plan. By studying these behaviors, one might discern some aspects of the plan, but companies rarely discuss the details of their business plans publically. So too with the document that describes your brand’s positioning. It is a private document. It provides clear answers to the questions of Context, Brand Promise, Personality and Values that are outlined above. The document outlining your positioning does not need to be lengthy or complex, but the criteria for successful positioning are clear. In twenty-two years of working with life science companies, it is worth noting that only a small handful of clients have had a clear, concise, robust positioning document at the start of our engagement. Because positioning is private, most companies skip the effort required to develop a clear definition of their desired positioning, and focus instead on the public expression of their (weakly defined) positioning: taglines, messaging, identities, etc. Positioning should be relevant, unique, credible, clear and stable. There are several attributes of successful positioning. Positioning should be relevant. If it is not relevant, the audience won’t care. Positioning should be unique. If it is not unique, your brand will be seen as undifferentiated (a commodity). Positioning should be credible. If your positioning isn’t credible, no one will believe what you say. Positioning should be clear. If it is not clear, your marketing efforts will be unfocused. Positioning should be stable. If your positioning varies by web page, ad, trade show or season you will confuse your audience about your brand’s context, promise, personality or values; this is catastrophic. Which is why you need to be conscious of positioning all the time. When life science companies are entering new markets or introducing a new offering, it is rare for the strategy of marketing to get much attention. Instead, the focus tends to be on the execution of key marketing tactics. While this may seem practical, it often leads to false starts, mixed messages and the unintentional establishment of positioning that does not align with the best long-term interest of the brand. This is an obvious waste of resources. It is much better to create a clear, simple marketing framework from the beginning, and ensure that all subsequent marketing efforts reinforce this. It is important to establish your brand’s clear positioning and then stick to it. While the executional tactics you use to convey aspects of your brand’s positioning will vary over time, the positioning should stay firm.